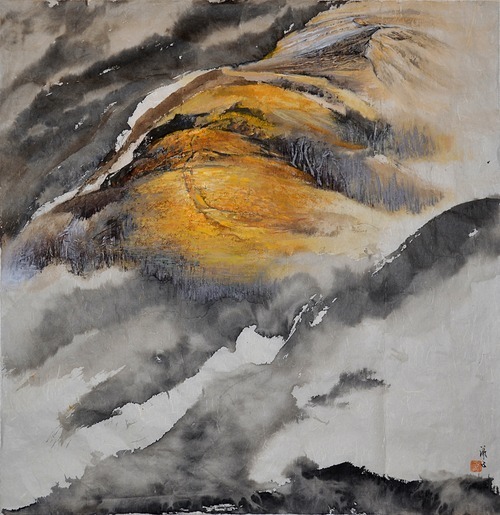 Wei Huang’s work renders the golden California landscape to breathe and pulsate. The art’s life force is the rendition of jetting air streams, overpouring fog, and rolling cloud herded by the pacific winds. In contrast to traditional widescreen landscape style, she enlivens a mountain as if seen through a glider launched from the coast. The metaphysical presence of the mountain we discern is but the tip of the iceberg of the whole. In short, her mountains are so grand that the concept of shape no longer suffices as an intrinsic property. She paints fog and cloud thinning to partially divulge a golden mountain range, as if the back of some continental entity. The brief moment affords us a glimpse of forests of the ages, withdrawn into the entity’s wrinkles and crevasses. Mystic auras shroud them in quasi-hibernation, perhaps sustaining them for rainy season’s delayed visit. The rolling cloud can spirit away this rare sight at any moment, not to reappear until the entity stirs, perhaps for decades or aeons. Weizi (Wei Huang) lives in San Francisco and at times Michigan. Her art has been singly exhibited six times and invited to international art exhibitions many times. Portions of her art have won awards and collected. Unlike repaintable oil, water color strokes permanently absorb into the Xuan paper canvas’s fibers. Like any master with decades of practice, she shapes brushes, times dryness, and dilutes ink/color within the minutes time window before a stroke dries. Moreover, she employs the uniquely Chinese perspective of leaving the canvas partially blank, for blankness stimulates our brain to imagine the vastness of distant space, a transcendance over blankness perturbed. The exhibiting Wuhou Shrine Museum is the center of study of China’s historically famous Three Kingdoms period, popularized in the world through many adaptations in movies, video games, and novels. Their invitation to Wei Huang signifies the embrace of foreign elements in a heartland of China’s rich heritage, a confident display of openness. As perhaps the first of its kind in China’s southwest, this heavy weight platform provides the rare opportunity for additional contemporary living American artists to paint into the Chinese consciousness.